Customers can use these elements to inspire a choice from one of our many Carpets on display or continue through the custom made process and allow us to bring their ideas to life with a custom created Carpet. Our range of Handloom carpets are perfect match to different home décor. These handloom woolen carpets are available in various geometrical designs and beautiful colors. We offer high quality and hugely demanded Hemp Carpet. These are available in various colors, designs and patterns. These carpets enhance the beauty of home decor. We are involved in offering a wide range of Handmade Woolen Carpets to our most valued clients. These carpets are made from high quality raw materials and are made by our skilled team of artisans.The color combination of black with ivory ground makes it look royal suitable for use in the lounge area. Indo gabeh convey the whim and artistic genius through imaginative designs. They look fabulous on the floor of every room. 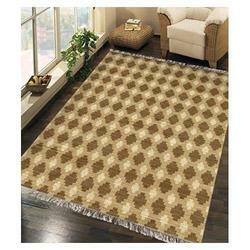 The company is a highly sought-after Manufacturer, Exporter, and Supplier of Handloom Plain Carpets. The elegance of designs as well as variety of sizes, colors, and shapes forms the hallmark of the range of Handloom Plain Carpets. The simplistic prints of the Handloom Plain Carpets make them even more effective as they light up the household or office. The carpets that we offer are available in varied sizes, colors, designs and patterns. With the most colorful design and pattern, we are providing the most vibrant range of traditional carpets which can easily impress anyone. We put them into the floors, they just become an attractive advantage to the floors.